This section provides a reference list of the evidence and sources used to build a digital reconstruction of the Theatre Royal. A special thank you goes out to Theatre Royal specialist, Conor Doyle, for sharing and providing access to some wonderful additional source material, and in particular a number of colour images of the stage area from Bill Golding’s photographic collection and video footage of the theatre’s demolition. And also a very warm thank you to Nora Thornton of the National Photographic Archive (National Library of Ireland) who assisted in finding historical photographs, which have provided invaluable evidence for the theatre’s interior décor. Theatre Royal, Dublin: Front Façade. D129-59. Black & white photograph. The Fáilte Ireland Tourism Photographic Collection. 1951. Walker, Michael S. April 1962. Theatre Royal, Dublin (Front Façade). WALK 127. Colour Photograph. Michael S. Walker Collection. Walker, Michael S. July 1962. Theatre Royal, Dublin (Main Entrance). WALK 127A. Colour Photograph. Michael S. Walker Collection. Cashman, Joseph. January 1935. The ‘New’ Theatre Royal (1935): Front Façade. 0508/081. Black & white photograph. RTÉ Cashman Collection. Cashman, Joseph. January 1935. The ‘New’ Theatre Royal (1935): Front Façade. 0508/082. Black & white photograph. RTÉ Cashman Collection. NA_OPW/5HC/4/955/1 (DWG No. : 8/3/8). 6 January 1934. Block Plan Shewing Theatre Royal. Blueprint. Feet (Scale bar included). Leslie C. Norton and Messrs Scott & Good. OPW/5HC/4/955/2 (DWG No. : 111). March 1934. Proposed Reconstruction of the Theatre Royal, Hawkins Street, Dublin for the Dublin Theatre Company Ltd: Foundation and Basement Plan. Blueprint. Scale: 8 feet to 1 inch. —. OPW/5HC/4/955/3 (DWG No. : 112). March 1934. Proposed Reconstruction of the Theatre Royal, Hawkins Street, Dublin for the Dublin Theatre Company Ltd: Stalls Floor Plan. Blueprint. Scale: 8 feet to 1 inch. —. OPW/5HC/4/955/4 (DWG No. : 113). March 1934. Proposed Reconstruction of the Theatre Royal, Hawkins Street, Dublin for the Dublin Theatre Company Ltd: Mezzanine Floor Plan. Blueprint. Scale: 8 feet to 1 inch. —. OPW/5HC/4/955/5 (DWG No. : 114). March 1934. Proposed Reconstruction of the Theatre Royal, Hawkins Street, Dublin For the Dublin Theatre Company Ltd: First Floor Plan. Blueprint. Scale: 8 feet to 1 inch. —. OPW/5HC/4/955/6 (DWG No. : 115). March 1934. Proposed Reconstruction of the Theatre Royal, Hawkins Street, Dublin for the Dublin Theatre Company Ltd: Second Floor Plan. Blueprint. Scale: 8 feet to 1 inch. —. OPW/5HC/4/955/7 (DWG No. : 116). March 1934. Proposed Reconstruction of the Theatre Royal, Hawkins Street, Dublin For the Dublin Theatre Company Ltd: Third Floor Plan. Blueprint. Scale: 8 feet to 1 inch. —. OPW/5HC/4/955/8 (DWG No. : 117). March 1934. Proposed Reconstruction of the Theatre Royal, Hawkins Street, Dublin for the Dublin Theatre Company Ltd: Fourth Floor Plan. Blueprint. Scale: 8 feet to 1 inch. —. OPW/5HC/4/955/9 (DWG No. : 118). March 1934. Proposed Reconstruction of the Theatre Royal, Hawkins Street, Dublin For the Dublin Theatre Company Ltd: Roof Plan. Blueprint. Scale: 8 feet to 1 inch. —. OPW/5HC/4/955/10 (DWG No. : 119). March 1934. Proposed Reconstruction of the Theatre Royal, Hawkins Street, Dublin for the Dublin Theatre Company Ltd: Longitudinal Section A. A. Blueprint. Scale: 8 feet to 1 inch. —. OPW/5HC/4/955/11 (DWG No. : 120). March 1934. Proposed Reconstruction of the Theatre Royal, Hawkins Street, Dublin for the Dublin Theatre Company Ltd: Cross sections (Section on Centre-line of Entrance Hall Stairs & Section through Auditorium). Blueprint. Scale: 8 feet to 1 inch. —. OPW/5HC/4/955/12 (DWG No. : 121). March 1934. Proposed Reconstruction of the Theatre Royal, Hawkins Street, Dublin for the Dublin Theatre Company Ltd: Front & Rear Elevations. Blueprint. Scale: 8 feet to 1 inch. —. OPW/5HC/4/955/13 (DWG No. : 122). March 1934. Proposed Reconstruction of the Theatre Royal, Hawkins Street, Dublin for the Dublin Theatre Company Ltd: South Elevation. Blueprint. Scale: 8 feet to 1 inch. —. OPW/5HC/4/955/14 (DWG No. : 123). March 1934. Proposed Reconstruction of the Theatre Royal, Hawkins Street, Dublin for the Dublin Theatre Company Ltd: North Elevation Poolbeg Street. Blueprint. Scale: 8 feet to 1 inch. —. OPW/5HC/4/955/15 (DWG No. : 112). March 1934. Proposed Reconstruction of the Theatre Royal, Hawkins Street, Dublin for the Dublin Theatre Company Ltd: Stalls Floor Plan. Diazotype/ Hand Coloured. Scale: 8 feet to 1 inch. —. OPW/5HC/4/955/16 (DWG No. : 113). March 1934. Proposed Reconstruction of the Theatre Royal, Hawkins Street, Dublin for the Dublin Theatre Company Ltd: Mezzanine Floor Plan. Diazotype/ Hand Coloured. Scale: 8 feet to 1 inch. —. OPW/5HC/4/955/17 (DWG No. : 114). March 1934. Proposed Reconstruction of the Theatre Royal, Hawkins Street, Dublin For the Dublin Theatre Company Ltd: First Floor Plan. Diazotype/ Hand Coloured. Scale: 8 feet to 1 inch. —. OPW/5HC/4/955/18 (DWG No. : 115). March 1934. Proposed Reconstruction of the Theatre Royal, Hawkins Street, Dublin for the Dublin Theatre Company Ltd: Second Floor Plan. Diazotype/ Hand Coloured. Scale: 8 feet to 1 inch. —. OPW/5HC/4/955/19 (DWG No. : 116). March 1934. Proposed Reconstruction of the Theatre Royal, Hawkins Street, Dublin For the Dublin Theatre Company Ltd: Third Floor Plan. Diazotype/ Hand Coloured. Scale: 8 feet to 1 inch. —. OPW/5HC/4/955/20 (DWG No. : 117). March 1934. Proposed Reconstruction of the Theatre Royal, Hawkins Street, Dublin for the Dublin Theatre Company Ltd: Fourth Floor Plan. Diazotype/ Hand Coloured. Scale: 8 feet to 1 inch. —. OPW/5HC/4/955/21 (DWG No. : 119). March 1934. Proposed Reconstruction of the Theatre Royal, Hawkins Street, Dublin for the Dublin Theatre Company Ltd: Longitudinal Section A. A. Diazotype/ Hand Coloured. Scale: 8 feet to 1 inch. —. OPW/5HC/4/955/22 (DWG No. : 259). November 1934. Proposed Reconstruction of the Theatre Royal, Hawkins Street, Dublin for the Dublin Theatre Company Ltd: Front Elevation. Diazotype/ Hand Coloured. Scale: 8 feet to 1 inch. —. OPW/5HC/4/955/23 (DWG No. : 292). No Date. Proposed Alterations to Nos. 6, 7 & 8 Townsend St to form Lounge to the Regal Rooms & Scene Store to the Theatre Royal for the Dublin Theatre Company Ltd.: Ground Floor Plan. Positive Blueprints /Pellet Prints Hand Coloured (Ink). Scale: 8 feet to 1 inch. —. OPW/5HC/4/955/24 (DWG No. 293). No Date. Proposed Alterations to Nos. 6, 7 & 8 Townsend St to form Lounge to the Regal Rooms & Scene Store to the Theatre Royal (for the Dublin Theatre Company Ltd.): First Floor Plan. Positive Blueprints /Pellet Prints Hand Coloured (Ink). Scale: 8 feet to 1 inch. —. OPW/5HC/4/955/25 (DWG No. 294). No Date. Proposed Alterations to No.6, Townsend St., to form Lounge to the Regal Rooms (for the Dublin Theatre Company Ltd.): Second Floor Plan. Positive Blueprints /Pellet Prints Hand Coloured (Ink). Scale: 8 feet to 1 inch. —. OPW/5HC/4/955/26 (DWG No. 295). No Date. Proposed Alterations to No.6, Townsend St., to form Lounge to the Regal Rooms (for the Dublin Theatre Company Ltd.): Sections. Positive Blueprints /Pellet Prints Hand Coloured (Ink). Scale: 8 feet to 1 inch. Norton, Leslie C. OPW/5HC/4/955/27 (DWG No. 296). February 1935. The Theatre Royal, Hawkins Street, Dublin, Plans of the New Lounge bar and Revisions to Stage End. Diazotype/ Hand Coloured. Scale: 8 feet to 1 inch. Charles E. Goad Ltd. 1938. Fire Insurance Plan, Sheet 18. Scale: 40 feet to 1 inch. Charles E. Goad Ltd. 1960. Fire Insurance Plan, Sheet 18. Scale: 40 feet to 1 inch. Dublin Theatre Company. RP.D.340.6. Souvenir Programme of the Theatre Royal Hawkins Street, Dublin. September 1935. Dublin: The Ormonde Printing Company. Sika. RW.D.129. Basements Constructed with Sika. n.d. Dublin: Sackville Press, Printers. The secondary research sources listed here contain historical references, written descriptions, contextual descriptions and reproduced images relating to the 1935 Theatre Royal. Barton, Ruth. 2004. Irish National Cinema. London: Routledge Taylor and Francis Group. Devitt, David. 2013. 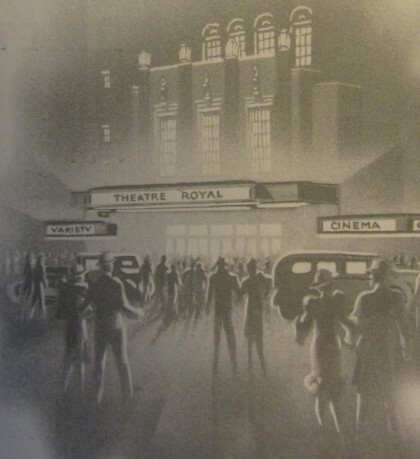 “The Theatre Royal – A Palace of Cine-Variety.” History Ireland 21(2): 36-39. Dunne, Declan. 2015. Mulligan’s Grand Old Pub of Poolbeg Street. Cork: Mercier Press. Dublin Evening Herald. 1996. Images of Dublin. Breedon Books Publishing Company. Gilbert Watson, Frederick. 2010. Building Over the Centuries. A History of McLaughlin & Harvey. Belfast: Nicholas & Bass. Kearns, George P. and Maguire, Patrick. 2006. The A to Z of all old Dublin Cinemas. Dublin: George P Kearns and Patrick Maguire. Keenan, Jim. 2005. Dublin Cinemas, A Pictorial Selection. Dublin: Picture House Publications. Kennedy, S.B. 1991. Irish Art and Modernism, 1880-1950. Belfast: Institute of Irish Studies at The Queen’s University of Belfast for The Hugh Lane Municipal Gallery of Modern Art, Dublin. Loeber, Rolf, Campbell, Hugh, Hurley, Livia, Montague, John and Rowley, Ellen (Eds.). 2014. Architecture, 1600-2000. Art and Architecture of Ireland, Volume IV. Dublin: Yale University Press. McAulay, Eve. 1998. “The Temples of the New Entertainment; the Architecture of the Irish Picture House.” Irish Arts Review Yearbook 14: 168-176. Murphy, Paula (Ed.). 2014. Sculpture, 1600-2000. Art and Architecture of Ireland, Volume III. Dublin: Yale University Press. Ryan, Philip. 1998. The Lost Theatres of Dublin. Westbury: Badger Press. Symondson, Anthony. 1995. “A New Setting for Evie Hone’s Rahan Windows.” Irish Arts Review Yearbook 11: 204-207. Wallace, Arminta. 2014. “The Times we Lived in: Masterly Rubenstein at Theatre Royal” The Irish Times Magazine, 20 Dec., 2014.